Enjoy mother nature and watching the lobster boats with your morning cup of coffee from the dining nook, the screened in deck or by the water in the adirondack chairs. Beautiful sun and moon rises; very close to the Schoodic Peninsula part of Acadia National Park; quaint harbor of Corea-by-the-Sea; screened in porch so you can enjoy the whole evening; go to the lobster co-op in town and buy your lobster right off the boat. Short ferry ride over to Bar Harbor (and take the free bus around Acadia National Park) or drive to the main part of Acadia National Park with thunder hole, Cadillac mountain, sand beach etc. Bring your kayaks to enjoy the bay and launch right from the property. You can also take a car ride to see 'Campobello' president Roosevelt's summer home just over the border into Canada (bring your passports). washer/dryer; granite counters; relaxing jetted tub overlooking the bay; wood fireplace; outdoor gas grill; fully equipped kitchen; Lots to explore in down east Maine. Beautiful view of water including lobster pots, boats, wildlife. Amazing house and amazing scenery! Our mother-daughter mini adventure was wonderful largely due to this amazing house and it’s beautiful location. The pictures on the vrbo website are exactly what you find when you arrive. The water is literally steps away! The house was spotless and had everything we needed to cook and to relax. Lots of brochures in the desk to help you plan outings. Even though we had rainy days while there, we enjoyed ourselves immensely. I hope to return in warmer weather and do some kayaking. Oh, added surprise was the big driveway- no need to hold my breath while maneuvering my truck. The home worked perfectly for our family of five. Great space for us to be together and room for kids to hang out in their own space. It has the best eating alcove with views all around. We had a great time exploring all the different areas of Arcadia. My wife and I thoroughly enjoyed our stay over Christmas week. We were looking for a relaxing week away — we got all we wanted and then some! This home is beautifully designed — we were so comfortable there, we felt like it could be our second home. The house is situated nicely so that it feels remote, even though there are neighbors not too far away. We were impressed by how the inside is beautifully open and bright during the day, with lots of wonderful views of the shore and the surrounding woods. Even though the house is designed to accommodate more, we found it cozy for just the two of us. The home is immaculately kept, and everything was neatly laid out and labeled to make it easy for visitors. Sheets and towels were laid out for our arrival, and there was plenty of wood for the fireplace. We enjoyed spending our days tooling around the area and talking with the locals, and curling up by the fire with a nice book (or I’ll admit, some tv) in the evenings. When it wasn’t too chilly outside, we loved opening the windows or patio doors and listening to the surf right outside the door. We especially enjoyed a few relaxing nights in the jetted soaking tub surrounded by views of the ocean. We love to cook, and appreciated that the kitchen was well equipped. We took advantage of the great deals on lobster, scallops, and clams at the local co-op, and enjoyed local seafood at almost every meal, including steamed lobsters (natch), lobster rolls, lobster bisque, seafood chowder, linguini with (red) clam sauce, and lobster ravioli for Christmas Eve dinner. We had a hard time leaving, and hope to visit again during warmer days. We would recommend this home to anyone. The place is just amazing! Beautiful view! The house was just perfect! Very clean and organized! Really was a 5 star staying! Thanks Wayne and Beth for sharing your beautiful home with us! God Bless ! We recently stayed at this home. I would recommend this home to anyone visiting Maine. 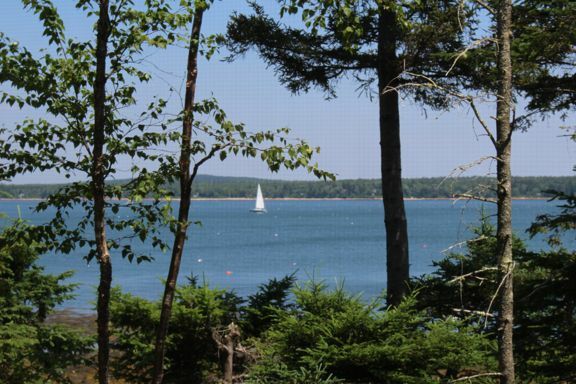 The wooded lot was nice and the property is much closer to the ocean then the pictures show. The drive to Bar Harbor/Acadia is an easy 50 mins. We went a little late in the season and a lot of the restaurants that were close to the property were closed for the season. That being said, if you are there in season there are a lot a restaurants that are close to the property.